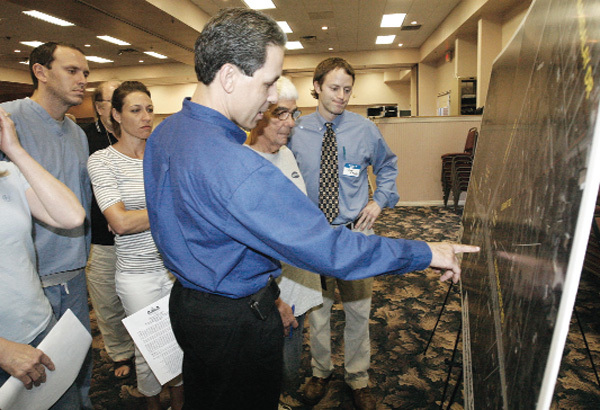 County Staff presents the final design of its Lithia Pinecrest, Lumsden, and Bell Shoals roads and Durant and Lumsden roads intersection improvement project. The meeting allowed residents to share their input and concerns before a final decision is made. Construction is planned for mid-2012. Hillsborough County held a public meeting earlier this month to bring residents up to date and discuss the proposed improvements now slated for the intersections of Lithia Pinecrest, Lumsden, and Bell Shoals roads and Durant and Lumsden roads in the Brandon area. Since the start of the project, there was little doubt about the task at hand for county public works staff in order to bring the troublesome and, by far, busiest intersections in the area, up to par with the current and future traffic demand. The meeting, held at Bells Shoals Baptist Church, located on 2102 Bell Shoals Rd., presented to the 60 or so attendees the project’s final proposed design, while allowing county staff to collect additional input and comments from residents. “Once we will collect the comments, we will sort through and evaluate them, after which, we will host another meeting prior to starting construction,” said Hillsborough County Engineering Division Public Works Center Project Manager William “Reg” Alford. Alford explained that the project’s difficulty has to do with the intersection’s six existing and quite busy roadway approaches. The approaches have unconventional, skewed crossings that create conflicting movements for the vehicles along with the problem of the lane configurations and turn lane lengths, which do not provide adequate operational capacity for current and future traffic demands. “The intersection is without a doubt operating beyond its design capacity, resulting in significant vehicle delay due to traffic congestion and accidents,” Alford said. Traffic volumes are high during morning and evening peak hours. The northbound left turn lane on Lithia Pinecrest Rd. experiences the highest volume in the morning. The eastbound right turn lane on Lumsden Rd. is at its highest volume in the evening. Hillsborough County hired CH2M HILL to conduct a Project Development and Environmental (PD&E) study to determine the existing conditions and recommend improvements. In addition, a Traffic Engineering Report for the intersection was completed and presented at a public meeting in July of 2009, which was followed by another public meeting, resulting in a final design concept that made way for this month’s meeting and progressing with a final design. Presented by county staff the current traffic pattern will remain the same on all the major approaches. • For the southbound approach on Lithia Pinecrest Rd. Add an additional right turn lane, an additional left turn lane and an additional through lane. Raised medians and concrete traffic separators will also be installed. • For the northbound approach on Lithia Pinecrest Rd. Add an additional left turn lane and an additional through lane. Remove the existing temporary traffic channelizer and replace it with a concrete traffic separator that runs the full length of the left turn lanes. Bicycle lanes will be installed on both the North and Southbound approaches. • For the Eastbound approach on Lumsden Rd. Extend the length of the existing right turn lane. Extend the length of the existing left turn lane. Replace the existing medians and traffic separators. • For the Westbound approach on Lumsden Rd. Add a right turn lane and extend the length of the existing left turn lane. Add raised medians and concrete traffic separators. Modify the connection of Durant Rd. and Lumsden Rd. to a right-in / right-out only configuration. In addition the existing traffic signals and poles will be replaced and sidewalks will be added or replaced to improve pedestrian connectivity through the corridor. The design for the project is scheduled to be completed in early summer of 2011, followed by the construction phase, which, according to Alford, is scheduled to begin by mid-2012. The right-of-way acquisition process will also begin this summer. The total estimated cost of the project is approximately $11.6 million and includes the PE&D study as well as land acquisitions.